A far infrared sauna has been shown to assist in weight loss, pain management, skin purification, detoxification and stress reduction. A far infrared sauna can also provide relief to patients suffering from arthritis, chronic fatigue syndrome, fibromyalgia, and certain skin conditions. Heating the muscles with infrared rays produces an increase in blood flow similar to that seen during exercise. Infrared heat is very gentle. The experience is similar to lying in the sun on a warm day and feeling the heat radiate to the core of your body. 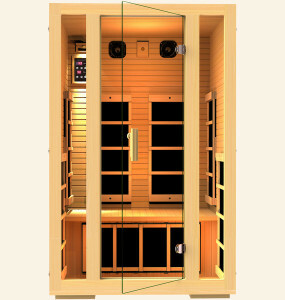 Unlike traditional (hot rock or steam) saunas–which operate at well in excess of 200°F–infrared heat has the benefit of being effective at a more comfortable operating temperature of 100°-150°F. Traditional saunas heat the air vs. the body directly which can make the experience unbearably hot and difficult to breathe. Because infrared heat penetrates human tissue vs. simply heating the surface of the skin, infrared saunas are seven times more effective than traditional saunas at detoxifying the body. By raising the body’s core temperature, infrared saunas can produce a sweat composed of 20% toxins vs. only 3% toxins with a traditional sauna. There are no showers available so be sure to shower before coming to sauna. We will have a warm moist towels to wipe the body down afterwards. Because the saunas are private we recommend that people strip down entirely or wear a bathing suite before getting in there. Anything that enters the sauna is probably going to be soaked. Be sure to bring a towel to wrap yourself in and to dry off with. Bring lots of water to stay hydrated!! !